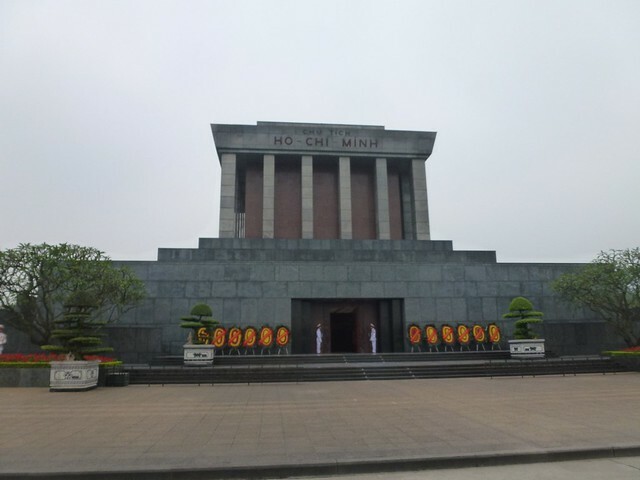 It’s our last day in Hanoi and we decided to spend the morning visiting the Vietnam revolutionary museum before heading to our next destination – Ninh Binh. The museum was ok, but not as good as the museums we visited the day before. 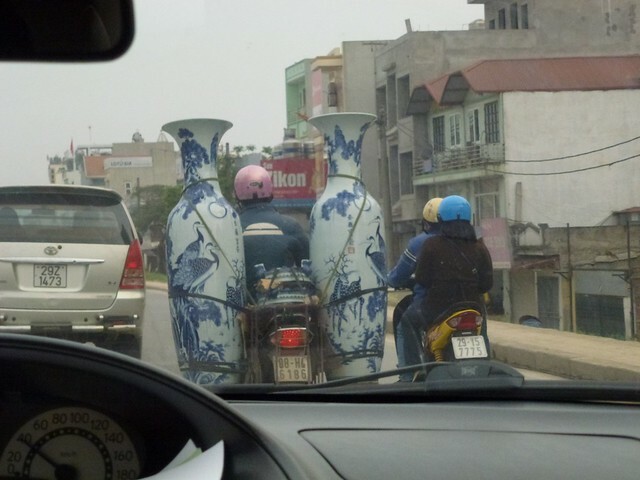 Our next stop would be Ninh Binh. 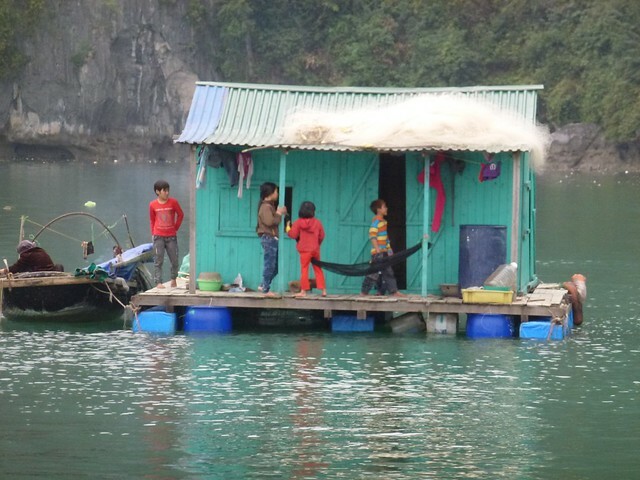 Most visitors tend to visit Ninh Binh on a day trip from Hanoi but we decided to arrive a day earlier to explore the town on our own before booking a tour for the following day. 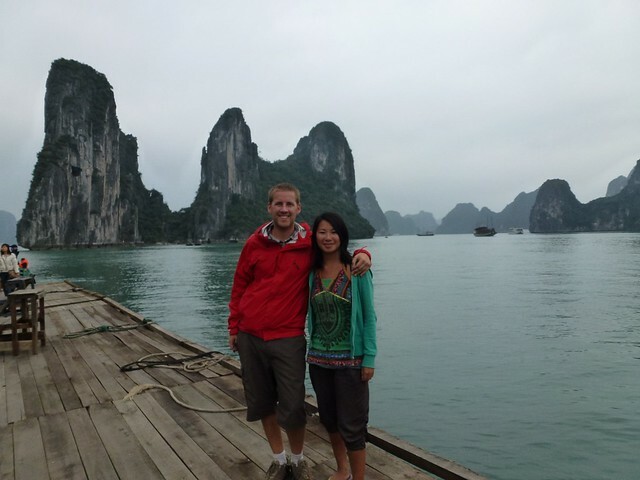 From Hanoi, we took a local bus to Ninh Binh but the bus didn’t leave for ages from the local bus station in Hanoi. 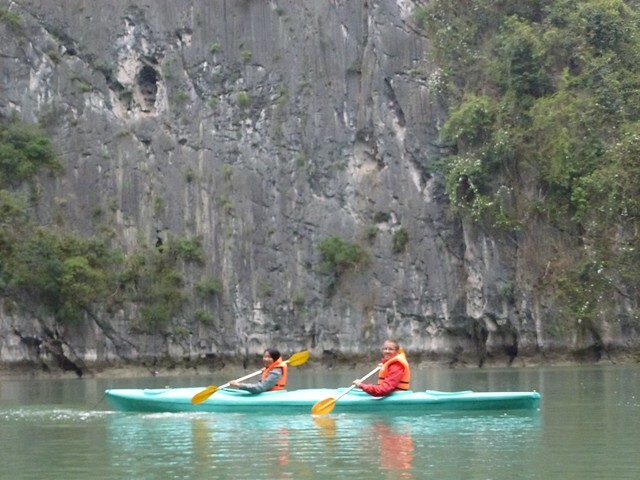 We ended up arriving in Ninh Binh around 3.30-4pm. We checked in at the very nice NhaViet Mountain Hotel and booked a tour to Tam Coc for tomorrow. We headed out to the town centre for some food. 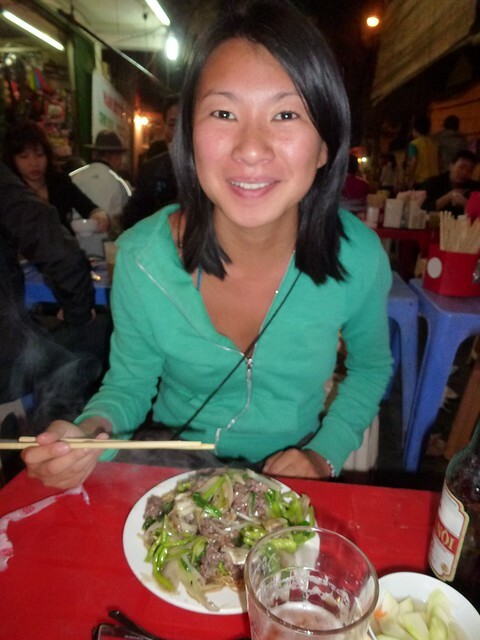 Apparently Ninh Binh is the place to go if you are looking to eat dog. 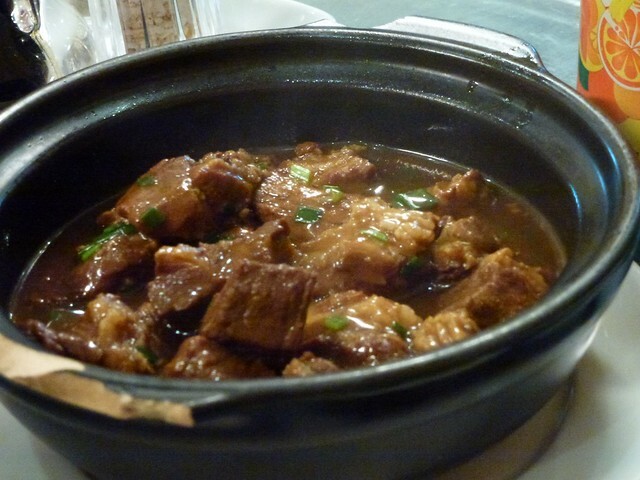 We saw one or two signs for dog but in the end we decided on some really nice duck and rice! 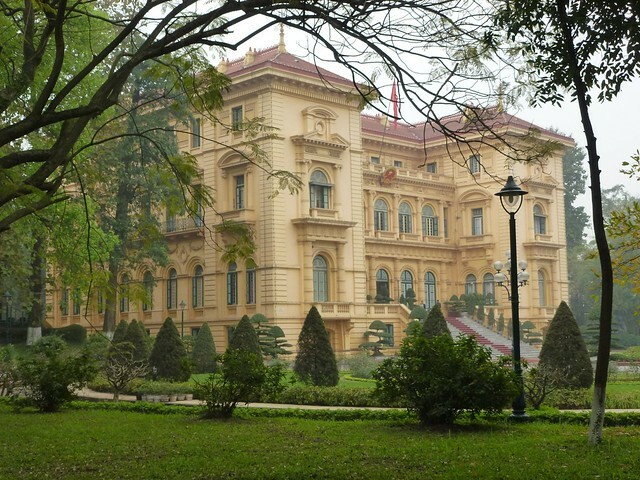 One of the many tourist attraction in Hanoi is seeing the preserved body of Ho Chi Minh. When you think about it, it’s kind of creepy. The tourist attraction is free but the queue to get in is very very long. We queued for around 2 hours before we were finally inside. The millions of school kids in the line will surely keep you entertained by shouting “hello” at you at every opportunity! Before being allowed into the mausoleum our camera was taken off us along with our bag. When we reached the building we were ushered through very quickly by soldiers with guns. We spent no longer than 2 minutes looking at the preserved body of Ho Chi Minh through a glass coffin. After seeing the main man we got the camera back and headed around the grounds which included his old house, cars and other personal items. 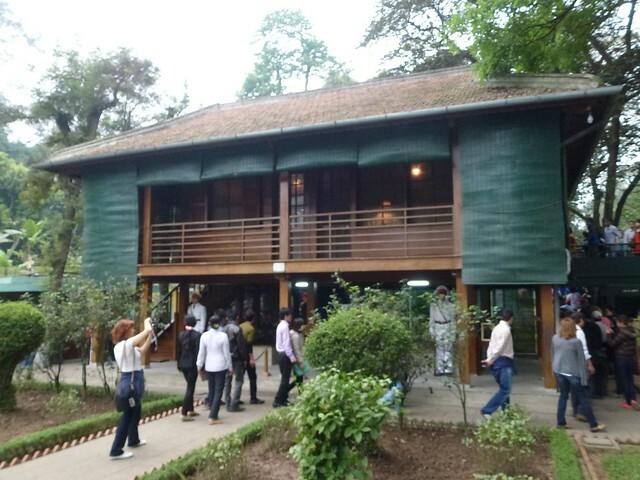 It was interesting and provided a good opportunity to learn more about the country’s history. We then jumped into a cab to get to the other side of the city to visit a couple of museums. After a short period we realised that the meter in the cab was rigged and the price of the fare was going up, up and up. The fare went past $7 which is where it should have been, to over $10, then $15. We both started to shout at the driver who then shouted back and threatened to call the police. However John was quite adamant it was a scam, gave the guy $10 or so, explained that was all he was getting and we both jumped out the cab. He drove off! The whole experience left us a little annoyed, but we handled it well. We continued our educational day trip by visiting two museums in the afternoon. 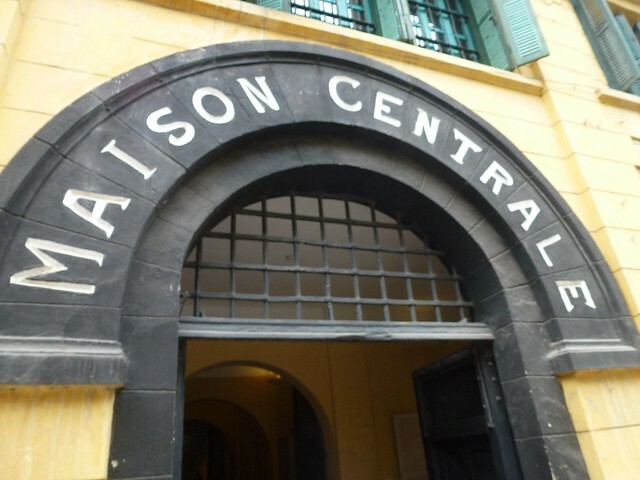 Hoa Lo Prison which is also know as the Hanoi Hilton where prisoners of war from the French occupation and the the war with the US were held. Propaganda levels were not too bad (more of that to come down in the south) and it gave a good history of the occupation by the French and the prisoners that were held during the war with the US including presidential nominee John McCain. 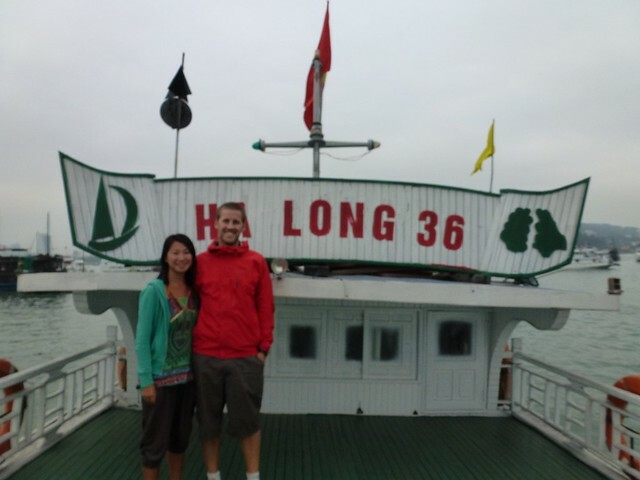 He crashed his plane into Trúc Bạch Lake which we visited the other day and spent 5 years in prison. 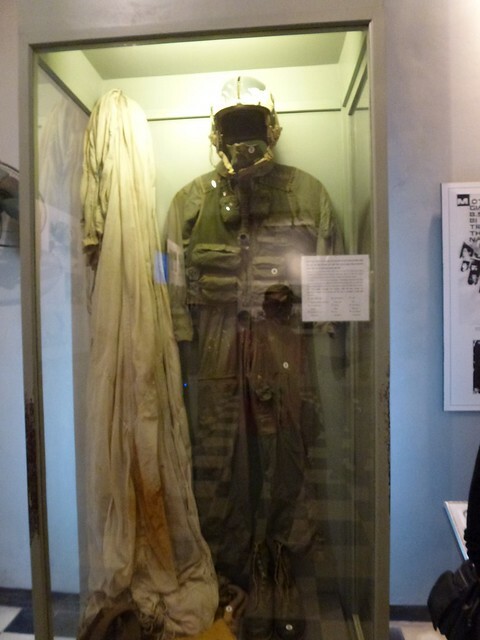 His flight suit and parachute were on display in the museum. 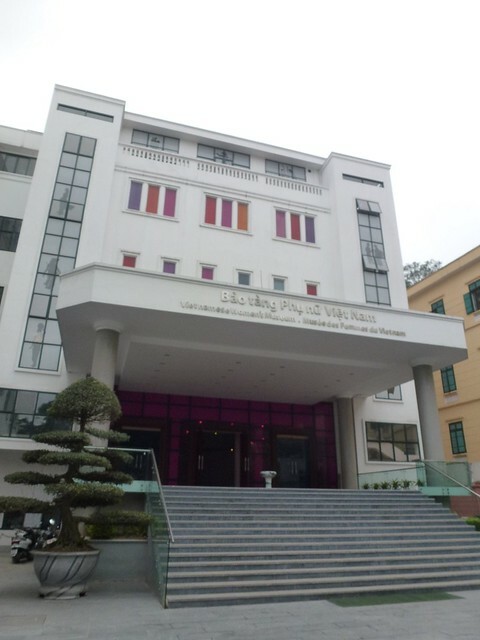 After lunch we then headed over to the impressive Bảo Tàng Phụ Nữ Việt Nam known as the Women’s Museum. Set over several floors it covered different topics from marriage, women in the country and a really interesting section on the women you see selling fruit in the streets. 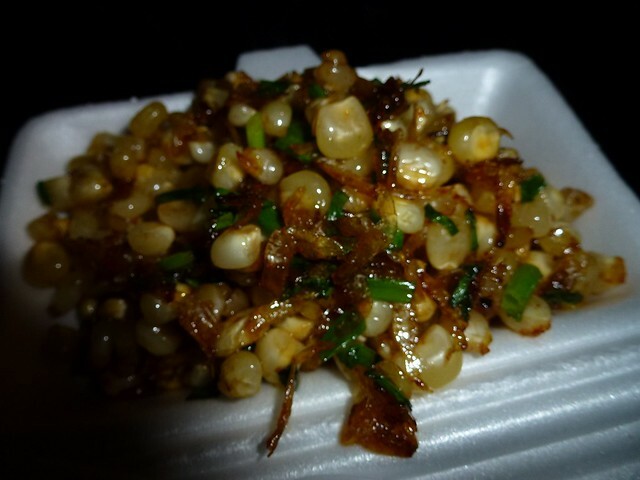 In the evening we ate street food again, picking up some ngô xào on the way back – a wierd fishy sweetcorn snack. 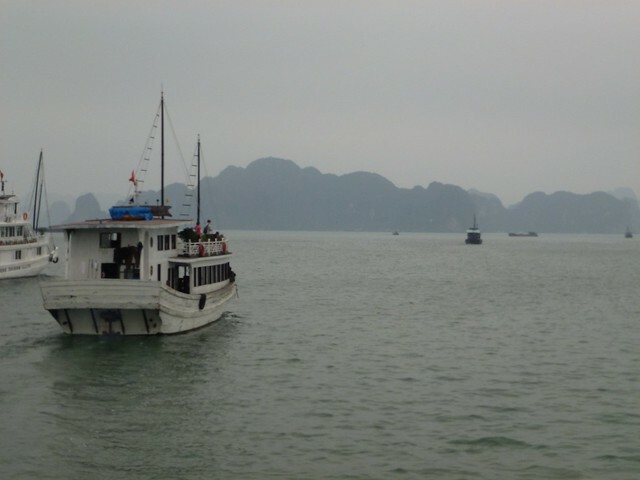 The number one day trip from Hanoi without a doubt is Halong Bay – another UNESCO site to add to our list! The weather wasn’t going to be great, but it wasn’t going to be raining or windy so the boat ride wouldn’t cause John too many problems. We decided just on a day trip which cost hardly anything after a bit of bartering with the travel agent. We were up at 7am and on the bus for 8am for the three hour trip north to the site where we were ushered onto a boat which took us around the bay. On the boat, we ate a very nice lunch consisting mostly of seafood. We shared our table with a Japanese couple, who also enjoyed the food as much as we did. There was plenty to go around! 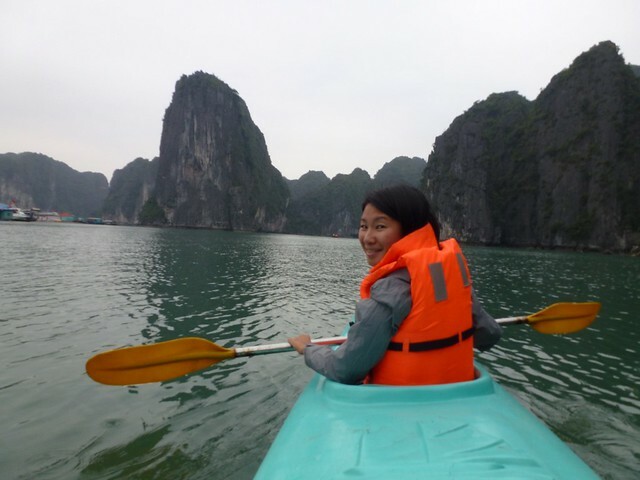 After lunch, we were able to kayak around Halong bay for about 40 minutes, gliding around the on-site floating village. I couldn’t help feeling that they must have felt a bit like a zoo, all these foreign tourists gawping at them every day from their little kayaks. However, there were some which clearly welcomed the tourists and had various fruits laid out at the front of their boats which they were trying to sell. 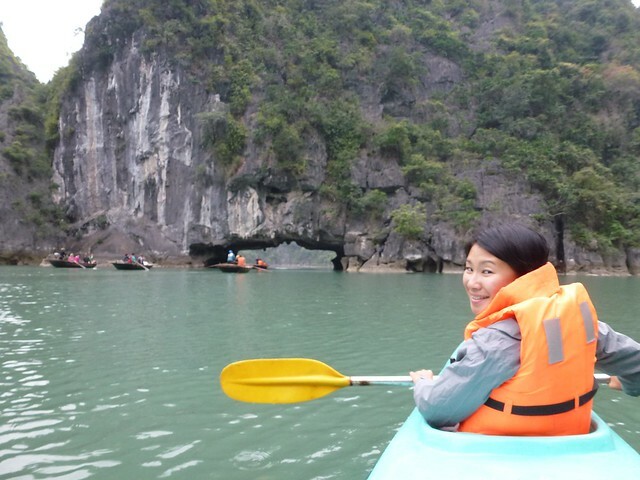 After kayaking, we were led into a cave for a guided tour. It was pretty touristy in there and the talk appeared to be very well practiced. They had installed some kind of uplighting in various parts of the cave, which seemed a bit tacky but expected. It was still good though! After the cave, we started making our way back to Hanoi, which took longer than expected as the bus got a flat tyre which needed to be changed. We eventually arrived back in the city at around 8.30pm. In the evening, we headed out for some street food. Whilst eating on the street, we bumped into the Japanese couple who joined us after they failed to find anywhere serving dog. We had a BBQ with chicken and veg. 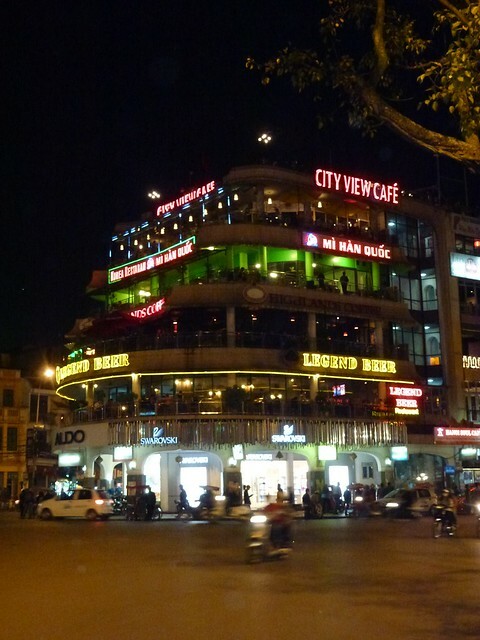 After dinner, we had a drink and met some interesting English people who were teaching in Hanoi. It was interesting to hear what life could be like as an expat here. 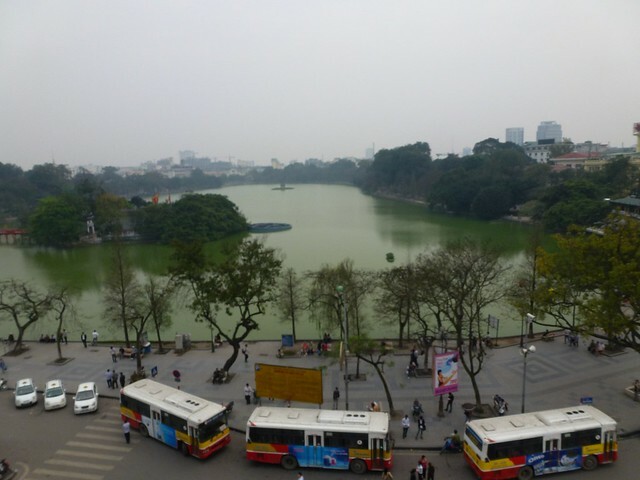 It’s much cooler in Hanoi compared with Laos and Thailand and the sky has been overcast all day. We decided to just head out for a wander around the local area. We had a couple of tasks for the day, buying a mobile phone to aid us in contacting my aunty who we would meet later in Vietnam, and booking a trip to Halong bay. 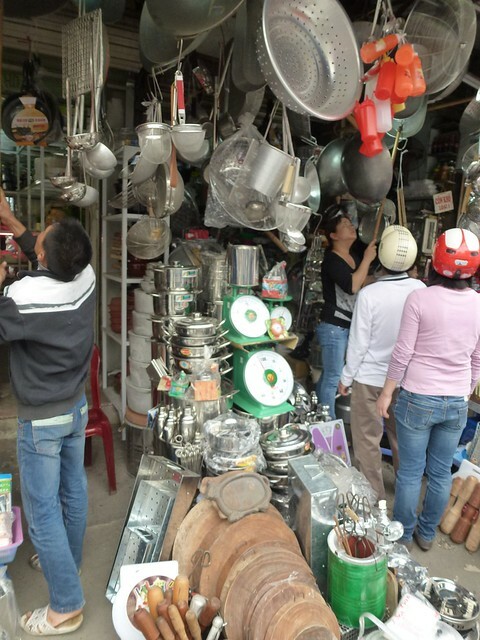 We headed to Chợ Đồng Xuân Market, a well known market just down the road, to try and buy a cheap phone. I took some explaining that we wanted a cheap and basic phone just to make calls and not a smartphone. It cost around £5-7 which was reasonable. After securing the phone we just walked around the streets in Hanoi which is great fun as long as you avoid the motorbikes. Every corner, there’s people selling fruit, meals, and clothes. The city is formed of old buildings, and lots of interesting places. After a drink we found a little place to have some Pho for lunch and then booked a day trip to Halong Bay for the next day. We thought about heading to see the very touristy water puppet show in the evening but I was feeling the effects of the change in temperature from Laos to Vietnam with a little cold. Instead we wrapped up with what warm clothing we had left and headed out for some noodles and beer. Yum! Today is the day we head to Vietnam, one of the country’s which we’ve been looking forward to the most on our trip. 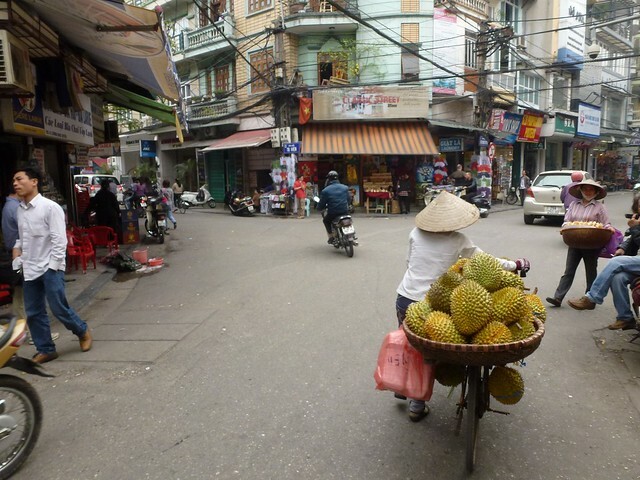 We got up relatively early and after breakfast we headed to the airport in a taxi for the flight to Hanoi. We had some really poor sushi at the airport and then jumped on a nice short flight with Laos Airlines. On the short flight they served a quick snack and drink – the trolley only got halfway down the plane before we landed. Fortunately for us, we were sat near the front end of the place so we managed to get served! We landed in a slightly colder and foggy Hanoi. We had pre-booked a hostel – May De Ville Backpackers Hostel – which was more like a hostel / hotel but reasonable at $6 a night. We arranged a taxi for $18 which saved some hassle. 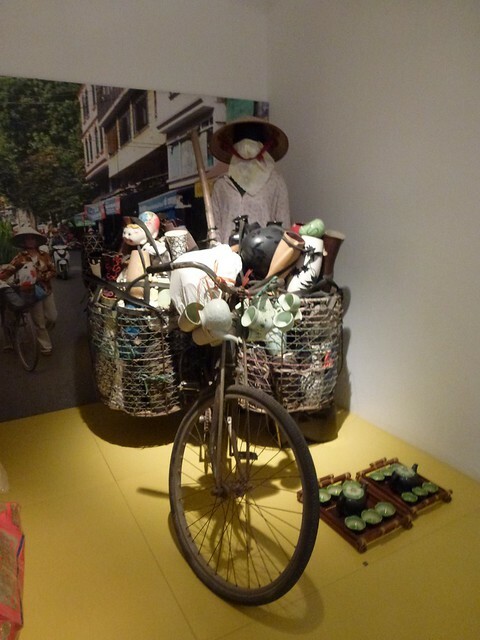 We had also been really looking forward to Vietnam for some time because people had mentioned how there was lots to do and see. It was cheap (though more expensive than both Thailand and Laos), but most importantly, we were looking forward to visiting the village where my mother grew up. My mum was born in China but moved south to Vietnam at an early age leaving after the war. 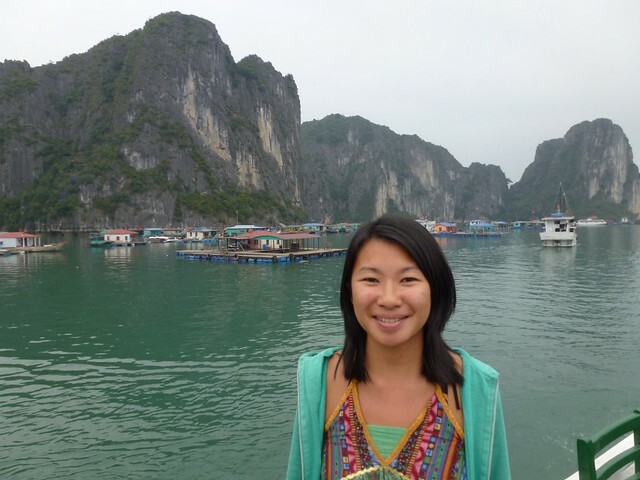 All through my childhood, my mother shared her stories from Vietnam and just before our trip, she had been trying to teach us a few Vietnamese phrases to help us get by…we were useless and can only remember how to say “milk” in Vietnamese. But more on my family history in a later blog post. The dorm we were staying in was nice but a little strange with the bathroom being behind some frosted glass – strange when you were taking a shower or on the toilet. 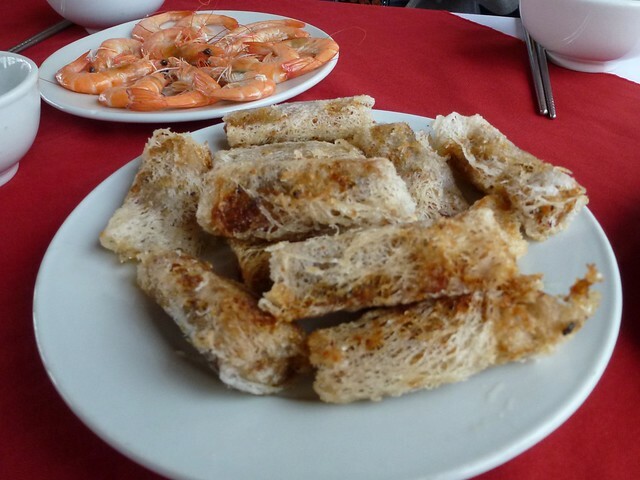 As with most buildings in Hanoi, it was a really thin building with loads of storeys – breakfast being served on the top floor! 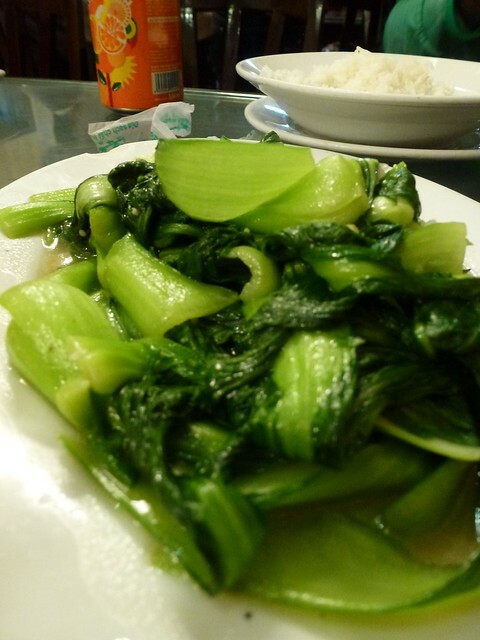 After a walk around the local area we found the recommended restaurant which didn’t disappoint. 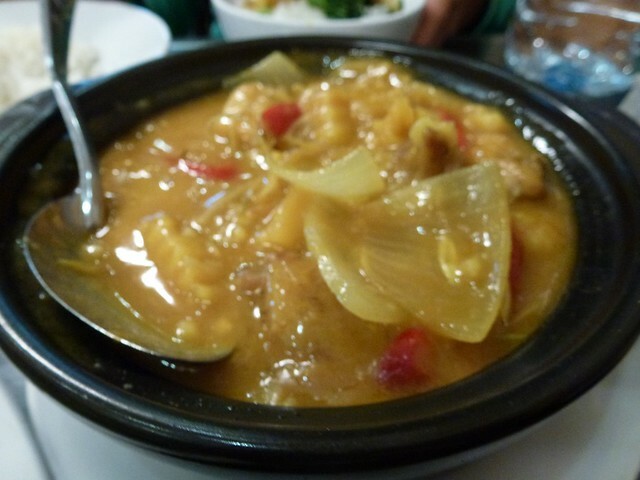 We had chicken curry, stewed pork and pak choi with rice. 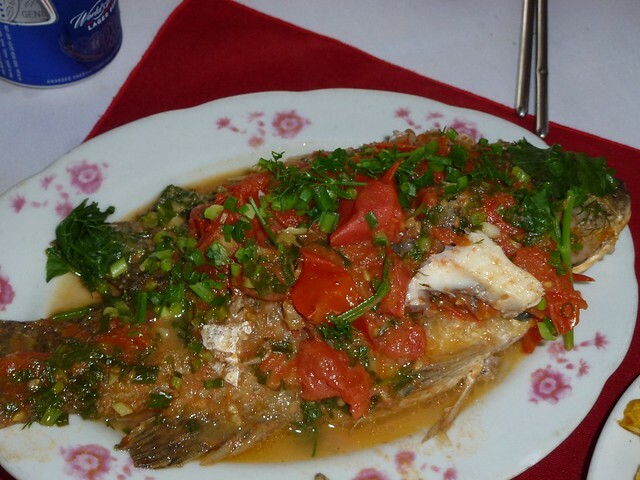 It tasted so much like my mum’s cooking. Delicious! After the food and our first Hanoi beers we walked around the weekend night market before heading to bed.